Park Street on 31st December night is usually a picture of grand illumination and huge crowds in a mood to party into the new year. But 2012 was a little different. The lighting on the streets took a back seat while candles took the lead. 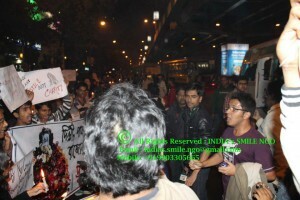 Crowd including housewife’s, students, social activists took to the street and sloganeered into the new year to protest against the growing number of rapes in the nation. While the country was mourning the death of the Delhi victim, reports swarmed in how a woman in Barasat (suburbs of Kolkata) was raped and murdered. The meet started to gather around 2 PM in the afternoon and a huge procession started from Park Street to Exide junction at 5 PM with candles in their hands, banners on their chests and slogans on their tongue. A motley group of 100 people started the procession shouting chants “ Delhir por Barasat ar noi aar noi” (Repetion of Delhi and Barasat, No More No More), “Purushtontotrer lampotyo aar noi aar noi” (Patriarchies perversion, No more No More.). By the time the group reached Exide junction another 150 awaited to join the chorus. What was phenomenal is on it’s way back from Exide junction towards Park Street the procession called for passer by’s to join and many reciprocated to their call. On its return, the total strength had crossed 400 and many more awaited the procession at Park Street. A signature campaign was initiated by a co-organising left leaning NGO that would be sent to the Governor and the President of India calling for more protection of the mothers and sisters of the nation. Saptarshi Banerjee of New Socialist Alternative was also part of the organizing team for the protest and also took a lead in sloganeering. In his interaction with the media, he clarified that this protest was not in opposition to any celebration of New Year, but the initiation of a long drawn fight against violence on women. Leaflets were distributed on the occasion and a link of the New Socialist Alternative (CWI-India) website carrying the soft copy of the leaflet was posted on the Facebook page of the protest. What was most important is the spontaneous participation from the city to join the procession or to sign the petition demanding for greater welfare measures from the State. Recently many MLA’s and MP’s of the ruling party in the state had gone on record stating how women should be blamed for their provocative attire resulting in such mishaps. Not only did we condem such statements but one of the main slogans that we shouted included “My skirt, My Dress, My Choice My freedom”, to which the crowd responded in chorus “Not yours, Not Yours”.